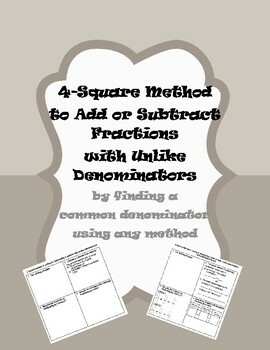 This product offers a 4-square method for adding or subtracting fractions with unlike denominators using any method of finding a common denominator. The student may choose to use the "product of the denominators" as the common denominator OR the lowest common multiple of the denominators as the common denominator. The 4-squares are numbered and help the student stay organized and help him/her with remembering the steps. Each square has brief instructions for the student. This is often a difficult concept for students to master, and this product will give them a way of staying organized and correct. 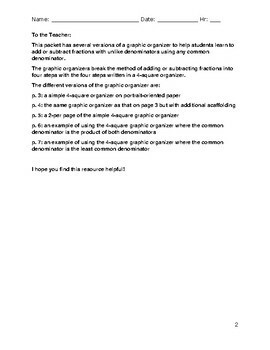 The product includes a 4-square graphic organizer on portrait-oriented paper, a 2-per page, a further-scaffolded version and two completed examples.